Cucumbers originated over 10,000 years ago in southern Asia. Early explorers brought these delicious vegetables with them to India and other parts of Asia. Cucumbers became very popular in Egypt, Greece and Rome where they were not only eaten but were used to help heal the skin. Cucumbers are great veggies and they are eaten fresh or pickled. Cukes that are eaten fresh are called slicing cucumbers. They are cylindrical in shape and commonly range in length from about six to nine inches and some are smaller or much larger. A cucumber’s skin ranges in colour from green to white. It can be smooth or ridged depending on the variety. If you look inside a cucumber you will see a very pale green flesh that is dense yet aqueous and crunchy at the same time. There are also many edible fleshy seeds. Some varieties, of cucumbers are grown in greenhouses and are seedless. They have a thinner skin and are longer in length than the slicing cucumbers. This variety is often called the “burpless” cucumber since they are easier to digest than other varieties of cucumbers. 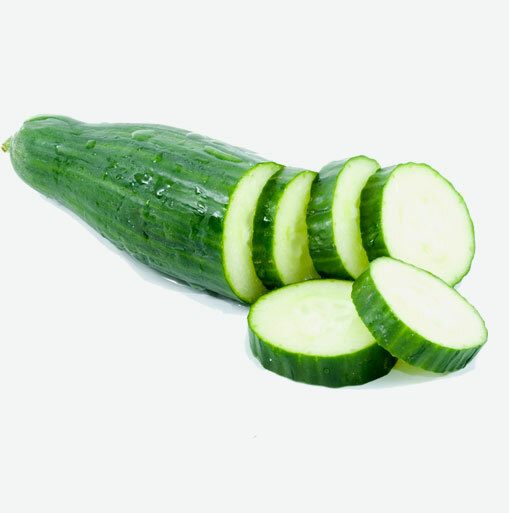 Cucumbers that are grown to make pickles are much smaller than the slicing cucumbers. Gherkins are one variety of cucumbers that are grown for pickling. Cucumbers have a flesh that is mainly made up of water but they also contain vitamin C and caffein acid which help soothe skin irritations and reduce swelling. Try some freshly sliced cucumbers over your eyes to refresh the skin around the eyes. It is relaxing and therapeutic. Don’t forget the skin on cukes because it contains fiber which helps to maintain regularity and has a variety of minerals such as silica which helps promote healthy hair, and is an essential nutrient that helps to maintain strong tendons, ligaments, cartilage and bone. Cucumber juice is often used a source of silica to improve the complexion and to help strengthen the connective tissues in the body. Cucumbers are sensitive to heat. Remember to look for cukes that are cool and refrigerated. Look for firm cucumbers that are rounded at the ends and display a bright to medium dark green colour. Avoid cucumbers that are yellow, puffy, have sunken water-soaked areas, or are wrinkled at their tips. Thinner cucumbers will generally have less seeds than those that are thicker. Store cucumbers in your refrigerator where they will keep for several days. If you do not use the entire cucumber, wrap the remainder tightly in plastic or place it in a sealed container so that it does not become dried out. The remaining cucumber should be used up within two days. Unwaxed cucumbers do not need to be peeled but should be washed well before cutting and eating them. Waxed cucumbers should always be washed and then peeled before using. Cucumbers can be sliced, diced or cut into sticks. Cucumber seeds are edible but most people don’t eat them. To remove the seeds, cut the cucumber lengthwise and use the tip of a spoon to scoop the seeds out. Slice fresh cucumbers and tomatoes. Sprinkle these with some fresh basil and a vinaigrette dressing. This makes a delicious salad. For refreshing cold gazpacho soup that takes five minutes or less to make, simply purée cucumbers, tomatoes, green peppers and onions, then add salt and pepper to taste. Add diced cucumber to tuna fish or chicken salad recipes for some crunch.